Hum, we'd basically be making the Purifier now...! Couldn't the purifier ray be launched from orbit? There was Raszagul from SCBW too. True. But there is a clear destinction when you take into account the multiple female units of the terran. And, as both Protoss females seem high-ranking, they clearly are not male-dominated or anything. That's what I like to see, :). Need a toss sniper rifle, something visually like the old mothership attack with the elongated detached beam. Not like a ray were its connect at both ends but a bolt of energy (purple colored). Also needs the properties like the raynor gun where it kills every unit alobg the path of the plasma bolt. +1 for female unit. Loved to here a selendis type voice for a usable unit. Another idea for a spell would be like a possesion that forces the sniper into the body of a single enemy unit and be able to control it without your enemey knowing it. Or what about instead of the purifier version of a nuke, have the sniper sacrifice itself tassadar style suiciding itself to combine all energies in a very large damaging wave with similar stats to a nuke. Do the nerazim even have females besides whatshername? I've seen female Khalai and Khalai who lose their psionic parts that connected them to the Khala and basically became nerazim because of no link with everyone. Maybe it should be a Khalai like that. I guess blizzard is being slightly sexist when it comes to protoss units and forgetting about females. I like AtikLYar's Psionic Crush idea. 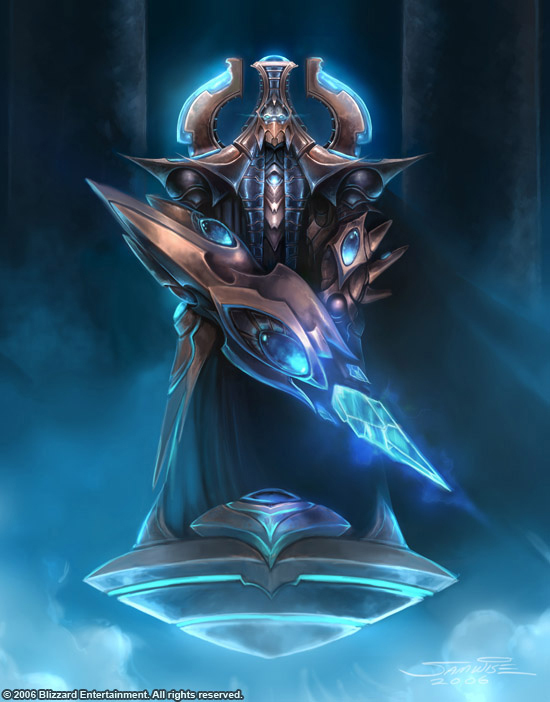 I don't think it should have an ability like Karass' Plasma Surge, at least if it is going to be a Protoss version of the Ghost unit. Maybe the sniper could be upgraded from DTs? And the "Academy" could be upgraded from the Dark Shrine? And here's the concept art of the Purifier unit to be used as a base for the weapon. The dark templar with the scythe, with a "minor" difference: he throws his scythe to attack like a boomerang that cuts stuff in half. Mercenary marauder whose model aims randomly, launching rockets targeted to his objectives. When he attacks, you may think he's failing miserably, but he's not. That's the parody I see of it :P.
It looks the same on both sides, with the exception of that "Shield" I drew below being on the outer side. Yes, the inner side looks dull around where the arm is... But it's the bloody inner side of a weapon. What's supposed to be there? I guess we could cover it up with a shield as on the other side if you guys dont like it the way it is, so that the dudes arm would be stuck in the middle of the weapon. Also, the symbol-thingy-in-a-circle on the left of the shield should be the player decal. Sorry that I didn't edit the image in photoshop beforehand, my comp died, and my image editing software with it, and im stuck on a crappy laptop >.> EDIT: Oh yea, colors are the usual Nerazim platinum with emerald decorations (so the crystal and stuff are emerald) The weapon fires beams from the spiky things at the end of it, energy comes from the crystal. 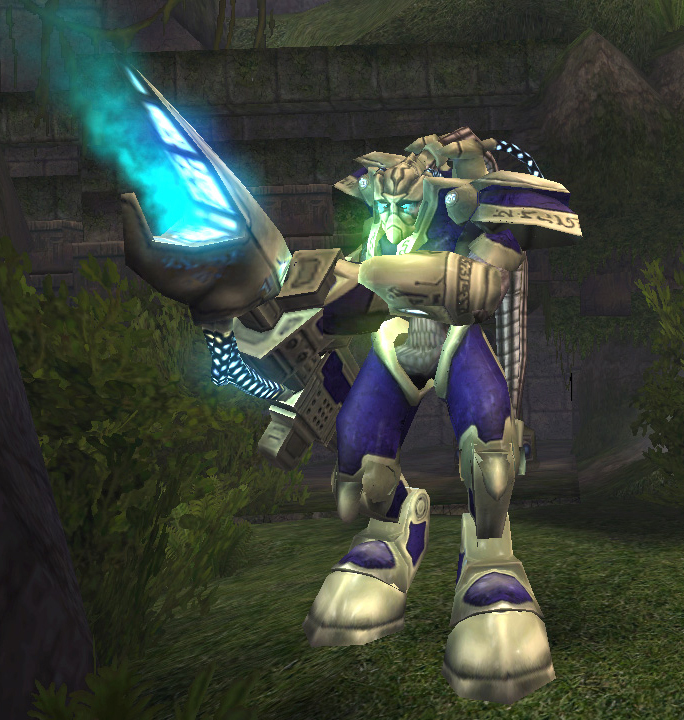 Beam models can be the Soul Hunter beams that can be found in the previewer. I'll just throw some ideas around. Here's the Vindicator picture (SG Ghost unit). His weapon looks better for a sniper than the previous Purifier I posted. The Vindicator was a slow but strong infantry unit, with a powerful beam attack. Vindicator would be a good name for this unit. The Protis Sniper could also inherit a few more ideas from this unit. It looks like he uses a mask covering part of his face, but unlike Zeratul and DTs it is a plating mask, more like Urun's mask/helmet. At least one of the Vindicator's nerve cords is linked to his weapon and that's a great idea as well, maybe the ones that aren't linked to the weapon were cut off like DT's. I don't quite know what it is about the observer, but it just seems like a sniper to me. Silently spinning in the air. Never revealing itself. Always watching. I don't think even the protoss know what goes on in the mind of an observer. If it was given a weapon to shoot with the entire universe would be in grave grave danger.